A suitable auxiliary substrate is necessary to facilitate anaerobic dechlorination (acetate, acetone and others). The anaerobic degradation of MCB and benzene is obviously possible only in combination with the reductive dechloronation of higher-chloronated benzenes. The hydrogen replacing the chlorine atom probably comes from water (Nowak 1994). Some papers report the production of the stable intermediate 1,2,3-TCB (Bosma et al. 1988; Ramanand et al. 1993). 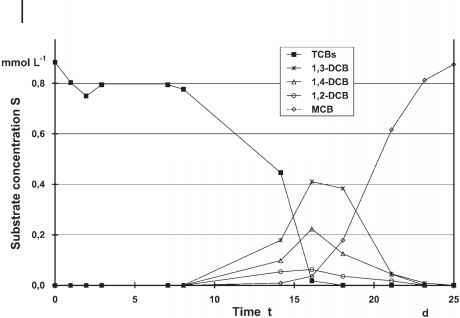 An example of the formation of intermediates during the anaerobic dechlorination of a mixture of 1,2,3-TCB, 1,3,4-TCB and 1,3,5-TCB in batch experiments (20 mg L-1 of each compound, 1-L flask tests) is presented in Fig 9.2. Table 9.3 Some chlorobenzenes, their properties and uses at T = 25 °C. For symbols used, see Table 9.1. - Intermediate in the production of trichloronitrobenzene, etc. a) Rippen (1991). b) Patterson (1985). c) Nowak (1994). 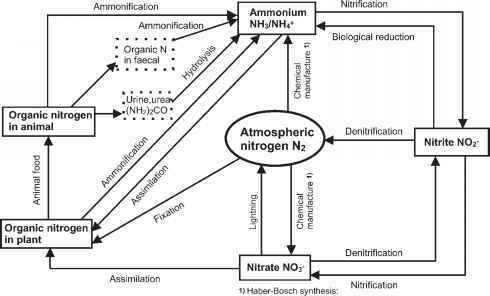 The mixed culture performing this degradation was obtained from methanogen-ic sediments of the Saale River near Jena, Germany. Acetone was used as an auxiliary substrate. It is remarkable that all three DCBs were observed in different amounts, presumably as a result of different degradation rates. Special cultures of aerobic bacteria seem to be capable of mineralizing all chlorinated benzenes from 1,2,4,5-TeCB (Sander et al. 1991) and 1,2,3,4-TeCB (Feidieker 1993) to MCB. Prieger-Kraft (1995) proved that both compounds were mineralized as the only source of carbon and energy. Currently, there is no confirmation of the aerobic elimination of PCB and HCB. In contrast to anaerobic dechlorination, during aerobic reactions the ring of the MCB is opened and chloro-cis together with cis-mucon-ic acid are formed. Only then can the chlorine atom be separated. Aerobic pure cultures use chlorinated benzenes as the only source of carbon and energy, with pmax = 13.2 d-1 with MCB (Reineke and Knackmuss 1984), pmax = 4.3 d-1 with 1,2-DCB (Haigler et al. 1992) and pmax = 1.7 h-1 with 1,3-DCB (De Bont et al. 1986). Fig. 9.2 Anaerobic reduction of three tetrachlorobenzenes (three isomeric TCBs, 20 mg L-1 of each), T = 28 °C, pH 7.28, auxiliary substrate: acetone (Adrian et al. 1995).